Real consumer spending increased 0.5% in September after a steady reading in August. In the third quarter, consumer spending increased at an annual rate of 2.4% vs. 0.7% in the second quarter. At first blush this is impressive, but digging further leads to a different story. The saving rate of households fell to 3.6% in September, putting the quarterly average at 4.1% vs. 5.0% in the first-half of the year. At the same time, real disposable income edged down 0.1% in September and fell 1.7% in the third quarter. 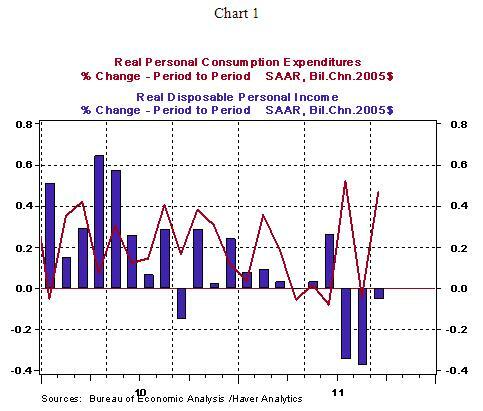 This information along with data from July and August suggest that consumer spending of the nature seen in July and September are not sustainable because household saving and income trends do not provide the necessary support for growth in consumer spending. The important implication is the tepid performance of consumer spending will translate to sub-par growth of real GDP. As noted earlier, the saving rate fell to 3.6% in September vs. 4.1% in August. 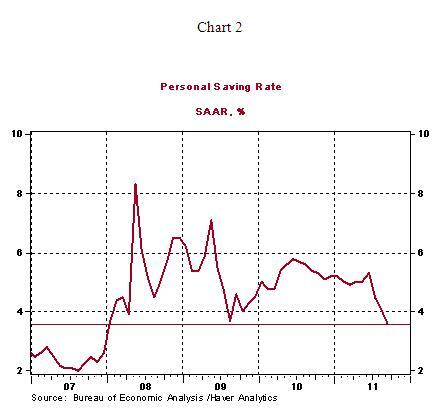 The latest personal saving rate is the lowest since early-2008. Deleveraging of household debt and an upward trend of the saving has led to the muted growth of consumer spending as the current recovery and expansion have unfolded. The September reading of the saving rate appears to be an aberration that is most likely turnaround in the months ahead as household rebuild their net worth. 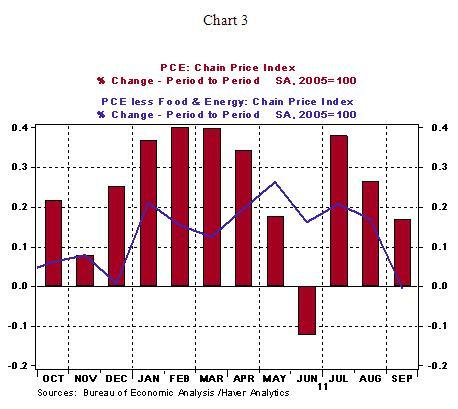 Inflation numbers for September vindicate the FOMC’s expectations. The personal consumption expenditure price index increased 0.2%, while the core personal consumption expenditure price index, which excludes food and energy held steady. Both price measures show a deceleration that is noteworthy (see Chart 3). Does not the drop in the savings rate reflect a need to dip into savings, or use credit, on the part of families as a result of a drop in income in order to consume? Won't dropping real income combined with low returns from many safe and popular savings programs make it hard for the savings rate to go up?